Knead dough as you do it to make roti’s and keep it in a fridge for sometime, so that it gets little easier to handle the dough while stuffing. Take the cauliflower and grate it gently, after grating salt the grated cauliflower enough so that it releases all the moistures from it and leave it for 10 minutes, after 10 mintues take some of the grated cauliflower in your hand make a fist and press hard to release all the moisture and you should have almost dry grated cauliflower. Repeat this to complete the rest of the grated cauliflower. I always prepare till here the night before i have to make it and keep it in the fridge.Now to the almost dried/less moistured grated cauliflower, add chopped green chillies, coriander leaves, ajwain and garam masala, mix it well and you have stuffing ready for the paratha. You don’t need to salt the stuffing anymore.Divide the dough into ball-sized portions and roll between your hands till they are smooth and without cracks. 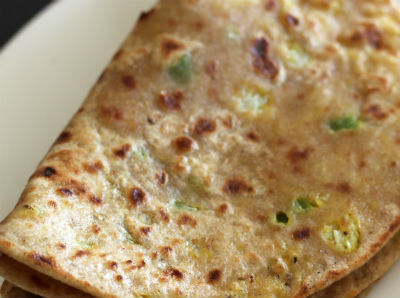 Press this stuffed pouch in between your palms to flatten it, so that you can roll it into circle.Heat the griddle and fry the paratha by glazing the oil on the surface of the paratha. Repeat this for the other side of paratha too. 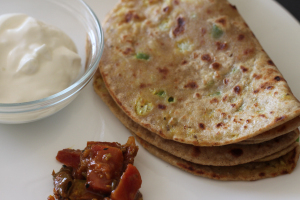 Serve it with curd and pickles of your choice.